Does Your Resume Make You Look Old? In an ever-challenging job market, it's no secret that your resume will either be the tool to get you in the door or will ensure that your efforts fall by the wayside. It's also no secret that a candidate’s years of job experience can be undervalued by prospective hospitality employers looking for youth (and perhaps the lower wage scale that often accompanies it). Countless applicants – young and older alike – offer resumes that are best categorized as tired, lifeless, or boring. Such resumes are sure showstoppers in the eyes of corporate reviewers who are frequently inundated in resumes. How, then, does a seasoned professional (perhaps 40-60 years of age) craft a resume that stands out from the pack, reflecting their experience, energy and attributes to best advantage? 1. Trim your employment history to reflect your past 10-15 years. If you have hard-hitting employment credentials beyond this period, summarize them in a section at the end of your employment history. But, don’t indicate specific dates for these earlier credentials. 2. Avoid leaving dates of education off your resume unless you have a strong strategic reason to do so. Leaving dates off may suggest to the employer that you are hiding your age and are older than your work experience might indicate. A rule of thumb is to omit college-graduation or other educational dates that are over 20 years old. 3. 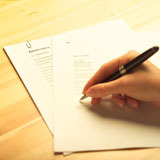 Ensure that your resume showcases valuable age-related attributes most likely to be valued by prospective employers – e.g. your judgment and decision-making abilities, your range of expertise, your reliability and dependable work ethic, and your commitment to corporate goals. 4. Highlight achievements that reflect strong technical or professional expertise, a high energy level, and the ability to flexible and adaptable. 5. Employment accomplishments need to be concise, but detailed. Employers want to know as specifically as possible what you will “bring to their party”. One benefit of (your) being a seasoned professional is that you will be more likely to bring a more specific level of expertise to any new assignment. However, be sure to articulate your accomplishments as concisely as possible – you want to keep your overall resume length to two pages if at all possible. 6. Leave off "references upon request" – this is a "given." Instead, have your reference list available (using the same font/format as your resume) upon employer request. Similarly, omit reference to hobbies or other ancillary items. 7. Most importantly, have your resume critiqued. Hiring managers repeatedly emphasize the need for a second (professional) set of eyes to review your resume. Many companies (like Allison & Taylor) offer this service. Considering the possible stakes – namely, your gainful new employment sooner, than later – an investment in a world-class resume will surely be money well spent. In summary, age discrimination can be a serious obstacle for older workers to overcome. Use your resume as the tool to get your foot in the employment door for that initial interview. Then, convey – with a sense of confidence and self-assurance – the value you offer that is likely unmatched by your younger competitors in the job market arena. Your new employer, and yourself, will be the beneficiary. Jeff Shane is a professional resume writer and Vice President of Allison & Taylor, Inc., a firm in the business of checking references for corporations and individuals since 1984. Allison & Taylor, Inc. is headquartered in Rochester, MI. For further details on services and procedures contact www.AllisonTaylor.com.